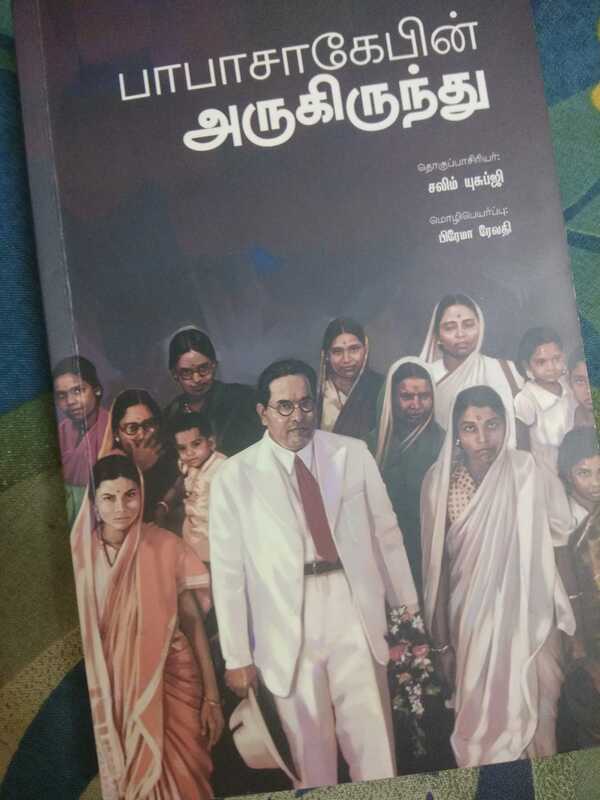 Urudhimozhi Sivaguru, a special correspondent at the Tamil magazine Ananda Vikatan, and a student of IIT Madras, has written this review of Babasahepin Arukirunthu, the Tamil translation of Navayana’s Ambedkar: The Attendant Details which features an introduction by the writer Azhagiya Periyavan. The Tamil edition was published by Maitri Books and launched by film director Pa Ranjith, with the first copies received by the children of the Nila Dhamma group, at the Neelam Panpattu Maiyam (Neelam Cultural Centre) stall during the recent Chennai Book Fair in January 2019. 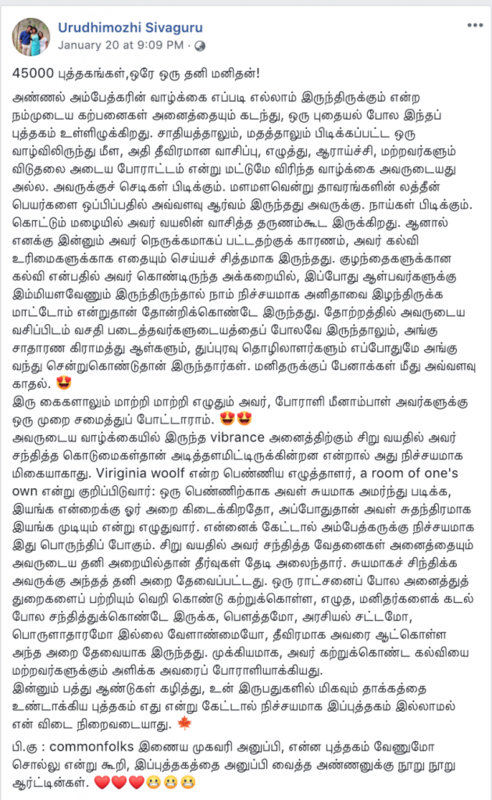 The review was posted in Tamil by Urudhimozhi on social media (translation by Prema Revati). Forty-five thousand books in a library. A library belonging to one man. A man infatuated with pens. This book lures us into a treasure of information that breaks away from all the ways in which we imagine how Ambedkar’s life would have been. His life was not just about obsessive reading and writing, and relentless struggle. He loved plants. He listed the Latin botanical names of plants with delight. He loved dogs. There is even a moment in which he plays the violin through a rainy night. But the closest I felt to him was when I read about his readiness to do anything for educational rights. If the present-day rulers had an iota of his dedication in educating children, I’m certain that we wouldn’t have lost S. Anitha [the engineering aspirant who committed suicide protesting the NEET]. This thought came back to me repeatedly as I read this book. His residence, with its appearance of affluence, was frequented often by ordinary villagers, conservancy workers and many others. He who was ambidextrous cooked a meal for social activist Meenambal Sivaraj [who presided over the first Women’s Scheduled Caste Federation Conference which was held at Madras in 1944 and attended by Dr Ambedkar]. It wouldn’t be wrong if we say that the obstacles and oppression he faced earlier in his life were the basis of his vibrancy. Virginia Woolf writes of the need of a room of one’s own, a room for every woman where she can be herself and read and function freely. If you ask me, this was true of Ambedkar too. For all the hurdles posed by caste in his early days, it was in his room that Ambedkar waged struggles to find solutions. Be it Buddhism, the Indian Constitution, economics or agriculture—his room made him the expert of all the fields he wanted to master. Most importantly it made him the crusader who wanted to give the gift of the education he had received to everyone. Babasaheb Arugirundu is one of the best things to have happened to me in the 20 years of my life. #MustRead. 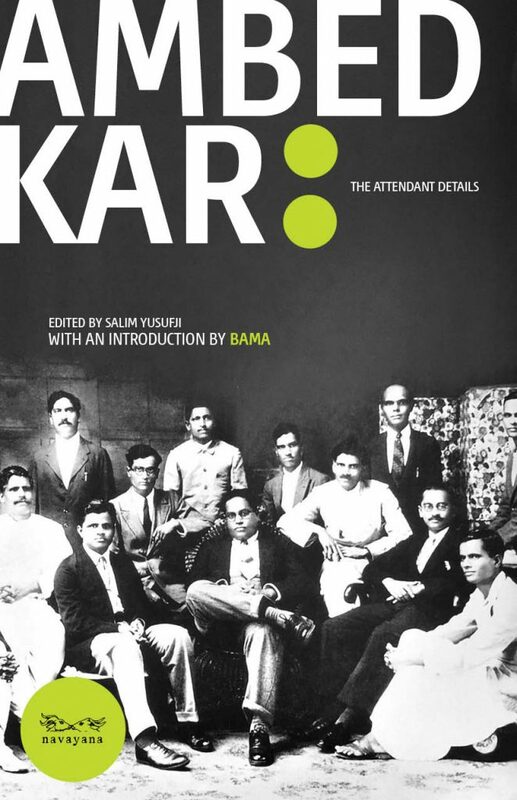 Buy the Navayana edition of Ambedkar: The Attendant Details here.